I just spent the first week of summer at my family's favorite place on Earth-the East Cape-45 minutes north of the Los Cabos International Airport and about 800 miles south of the border at the tip of the Baja peninsula. The area is a major tourist destination these days. You can play golf on world-class courses and experience some of the best sport fishing anywhere. You can windsurf, dive, snorkel, Jet Ski, kayak or roar up and down the beach on ATVs. If leisure is your thing-then just relax with a book by the pool. When you get hot, jump in, paddle over to the swim-up bar and order yourself a rum drink. Only a two-hour flight from San Diego, Phoenix or L.A., Los Cabos and its neighbor, the East Cape are perfect places to get away, relax and enjoy some of Mexico's celebrated hospitality and cuisine. Here is a collection of recipes from the area. Pick out a few and make yourself a fiesta of authentic Mexican delights for one of these hot summer nights! Who knows? These recipes and the stories that go with them may just inspire you to fly off to Los Cabos yourself! The East Cape extends from north of Los Barriles to Buena Vista and then south a ways to Cabo Pulmo. The area has an outstanding record for promoting conservation of its ocean wildlifethrough its catch and release program, which has kept lots of game fish (particularly the marlin and sailfish) off the endangered species list. This recipe serves four and takes only a few minutes to prepare. Fill four tall glasses with ice. 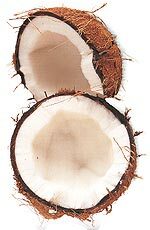 Add light rum, coconut rum and fill to the top with tonic. Put a dash of fruit juice and a dash of bitters in each glass and garnish with a slightly squeezed slice of lime. Serve immediately. The best beach in all of Los Cabos is at the Hotel Cabo San Lucas. It's called Chileno Bay and it's famous for its underwater rock formations and awesome diving. In hot weather like they have in Los Cabos during the summer months, a crunchy, cooling tropical salad like this one is a real delight. Anytime of year it's an ideal companion to hot, spicy dishes. The medley of tangy fruits and vegetables will not only surprise and delight your palate, but it may even get you started believing you've just come in from spending a day snorkeling Chileno Bay. Or perhaps you've just gotten back from a long day of fishing. As you take your first bite of this salad, you'll look across the patio of the outdoor restaurant of the Hotel Cabo San Lucas and marvel at the dimming colors of the sunset. You'll relive the day's events, seeing again in your mind the plethora of deserted islands, the crystal clear aquamarine water just teeming with abundant, colorful undersea life. And you will smile. It doesn't get any better than this! Serves eight and takes about 20 minutes to prepare. Mix lettuce and jicama in large salad bowl. Arrange onion rings on top. Peel grapefruit and Oranges, removing all white membrane from sections. Arrange with tomatoes on top of onions. Cover and chill for one to two hours. To make Cumin Dressing, combine vinegar, limejuice, oil, garlic and spices in food processor. Whirl until blended. Just prior to serving, peel, pit and slice avocado. Arrange slices on top of salad. Pour on dressing and toss gently. Serve immediately. My dad's favorite place on Planet Earth is Buena Vista on the East Cape. It is a fisherman's paradise, that in the old days (pre-swim-up bar) catered mainly to large groups of loud-mouthed, beer-and-margarita-swilling, poker-playing men and the occasional adventuresome and courageous women and children. Needless to say, my family went there-a lot. In those days, the hotel now known as the "Buena Vista Beach Resort" was called "Spa Buena Vista" or just plain old "Spa" to the regulars. Nowadays it's a very "chick friendly" resort that's famous the world over. We all love it � in fact we prefer its low-key ambience (and affordable prices) to the glitz, glamor and glitter of Cabo! We first had these vegetable kabobs at the Spa about a dozen years and at least as many chefs ago. They're almost identical to grilled vegetables you can get stateside these days, with a couple of small Baja-style differences. When you're barbecuing and in the mood for something a bit unconventional, remember these. They take next-to-no-time to make, and are festive, fat free and serve eight. Microwave or steam zucchini and yellow squash over boiling water for two minutes (until only slightly softened). Skewer zucchini and squash chunks, alternating with mushrooms on skewers. Mix together salsa and cilantro and brush over vegetables. Broil or grill for four minutes, brushing often with salsa. Add a tomato on each skewer and grill two minutes more. Seaport resorts in Baja and mainland Mexico always offer fresh cabrilla (sea bass), dorado (mahi mahi) or red snapper (huachinango) served this way. It's a timeless classic, full of nutritious vegetables and subtly spicy. This recipe for Veracruzana is from T�o Pablos's Bar & Grill in Los Barriles-a couple miles up the beach from Buena Vista. T�o's-as the locals call it-offers up the finest in patio dining in an old-fashioned Spanish courtyard setting. It's o a great place to escape the mid-day sun and grab a quick beer and fish taco under their palapa or in their Escorpi�n Bar. Go in on a weekday afternoon and you'll be amazed by all the resident gringas hanging out in the shade, sipping iced tea and munching on nachos (they're humongous and ever-so-good!) while playing Mah Jong. Really! The ambiance is pure Baja and the food is delicious. This meal serves four and takes about 45 minutes to prepare. To make the Salsa Veracruzana: Heat the oil, add the garlic and onions. Cook until onions are translucent. Add bell peppers and tomatoes, tomato puree, olive oil and seasonings and cook for five to eight minutes, or until the flavors are well-blended. Add the water to prevent sticking. Add olives the last three minutes. In a large saut� pan, melt the butter or margarine with the minced garlic. Saut� fish until white and flaky. Smother the filets in the Salsa Veracruzana. Serve immediately, dig in and enjoy! This recipe came from La Concha Beach Club, which is right to the north of the famed Melia Cabo Real resort in Los Cabos. It's home to a gigantic tide pool-a naturally occurring salt water formation big enough for plenty of people to swim in, with enough room for us to dive off the rocks and play in the waves, to frolic with the pelicans who were doing just about the same thing we were. We swam first and then went up the cliff to the restaurant and ate sizzling hot fajitas on the terrace under a giant palapa. And soaked up the incomparable beauty of the place! 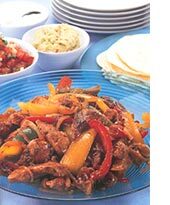 Fajitas are incredibly simple to prepare, they're fun to eat and they're delicious. These make enough great eats and good times for eight people and take about 40 minutes to prepare. In large bowl combine chicken, steak or shrimp with red and green bell peppers, onion, tomatoes, and jalapeZos or green chiles. In small bowl mix together oil, limejuice, vinegar, oregano, Worcestershire, beer, garlic, salt and pepper. Pour over meat and vegetable mixture and toss gently. Cover. Marinate three hours or overnight in refrigerator. About twenty minutes before dinner is to be served, heat a large skillet or wok until very, very hot. Drain off excess marinade. Pour chicken, steak or shrimp mixture into skillet and stir fry for six to eight minutes, until done. Place in serving dish. Put serving dish on electric or hot plate so that when it's served at the table, it stays hot. Put a bowl of guacamole, a bowl of salsa and a bowl of sour cream sauce on the table. Wrap tortillas in foil and heat in oven, or cook in microwave until steaming. Serve in a breadbasket to keep warm. Have each guest put fajita mixture into a tortilla. Garnish with guacamole, salsa and sour cream. Roll up into a burrito. This delicate fish is an East Cape favorite. Serves six to eight and goes perfectly with those Spa Vegetable Kabobs. Takes approximately five minutes to prepare after being marinated. In a 9 x 14 pan, pour wine, limejuice, tequila, Worcestershire Sauce and salsa verde over swordfish steaks. Marinate in refrigerator from one to two hours. Remove swordfish from marinade and grill on barbecue for four minutes on each side, or until done. While swordfish is grilling, melt butter or margarine in a small saucepan with garlic powder, cilantro, salt and pepper. Immediately prior to serving, pour equal amounts of butter sauce over each piece of fish. Serve immediately. At the far end of La Paz Bay (about an hour or so north of the East Cape � and another wonderful place to visit), just after you pass Pichilingue and the ferry docks and before you get to Tecolote Beach, is a famous rock formation known as La Balandra. It's shaped like a mushroom on a really long, skinny stem and it sits out in the light green water of a shallow bay right offshore. Accessible only by dirt road, it was actually knocked off its pedestal by vandals soon after the road was put through. Incredibly enough, some local engineers got together and hoisted La Balandra back up onto its perch, where it stands majestically and precariously to this day. This wonderful, delicate casserole dish of chicken with green chile was created on one of my parents' camping trisp on the beach closest to La Balandra, where there are a few ready-made campsites (meaning there are a few palapas scattered around on the deserted white sandy beach). You can swim or kayak from there out to see La Balandra for yourself before you have dinner. Be forewarned, however. Make enough! People are guaranteed to want seconds and it's easier than easy to make (takes about an hour)! Serves six. Season chicken breasts with salt and pepper. Heat butter and oil together in skillet and saute the chicken filets for a minute on each side, until they're lightly browned. Set aside. In same pan, fry onion until translucent. Set aside one can of green chiles. Add rest of chile strips to onions and cover. Cook over medium heat for five minutes. In food processor, blend reserved chiles until smooth with milk and salt. Add sour cream sauce and blend for a few seconds longer. Arrange half the chicken filets in a 9 x 14 inch baking dish. Cover with half the chile strips and half the sauce. Repeat. Sprinkle cheese over the top and bake at 350 degrees for about 30 minutes, or until chicken is done and cheese is melted. One of my all-time favorite Mommy Memories is of the first time I took my daughter, Gayle snorkeling in the warm, clear waters of the East Cape. We sneaked out before breakfast and dove into the warm water right after the sunrise. We held hands as we kicked through schools of yellow and gray striped tiger fish, spiny brown spotted blowfish and rainbow-colored parrotfish. "Umph, umph!" we'd grunt through our mouthpieces as we pointed to the reef below. I remember diving. Seaweed waved at me. Fish stared and swerved from my path. My ears crackled. I swam on, searching the cracks between rocks for those devious, darting flashes of fluorescent blue, yellow and turquoise-those tiny, exotic tropical sea creatures that are the most spectacular of all. Moments before my air ran out, I found two. Turned toward the surface and pointed. I heard Gayle's water-muffled laughter as the fish burst forth to gleam briefly in the ripples of reflected sunlight. When she got tired, we caught a gentle wave that beached us at the shoreline. We took off our snorkels and sat together as the waves lapped at our legs. Then we walked down the beach. I told her stories from my childhood, about this land of endless uninhabited coastline, simple folk and incomparable majesty. I remember seeing it through her eyes, as though for the first time. It was my favorite time of year in Southern Baja-October. The usually barren landscape was alive with color. There had been an inordinate amount of rain and the hillsides to our back were covered with wild California red bougainvillea. Flowering shrubs twined themselves seductively around the tall, many-armed cardon cacti. Stocky, over-built elephant trees lounged next to Orange-blossomed, lush-leafed ocotillos. The desert had been transformed into a tropical thorn forest of jungle greens, perfumed with fragrant crimson, yellow and purple blossoms. We passed a washed out riverbed. Whenever the rains unloaded on the mountains behind us, the waters would race to meet the sea, ripping up vegetation and tossing the debris of the hillsides on these now tranquil shores. Her growling stomach turned us back around and we returned to our hotel for breakfast. This recipe was inspired by that magical Baja morning. It makes six two-egg omelets, but can serve four if you prefer three-egg omelets. The fresh ingredients and fiery chiles make it a winner in my book. Takes about 30 minutes to prepare. Place diced onion in microwave cooking dish. Cook on high for two minutes, or until onions are wilted. Mix with cilantro, tomatoes, garlic, diced green chiles and jalapeZos. Add salt and pepper to taste. Microwave again on high for an additional minute, or until all ingredients are hot. Heat an omelet pan to medium heat. Melt one fourth of the butter or margarine to cover the bottom of the pan. Pour one fourth of the egg mixture into the pan and cook until lightly browned on bottom, about two minutes. Add one fourth of the onion, cilantro, tomato mixture and one fourth of the cheese. Cover pan and continue heating until cheese is melted. Fold omelet in half and serve immediately.